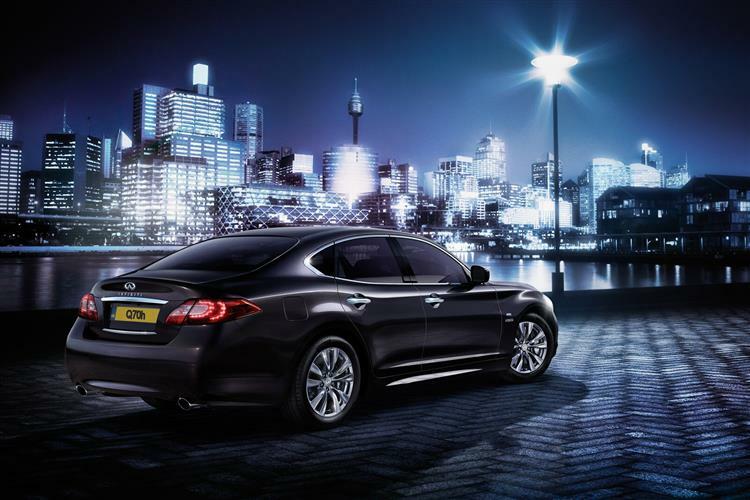 The Infiniti Q70 hybrid incorporates some intriguing technology and represents a tempting option for city dwelling executives, but it doesn't offer enough to tempt the vast majority of us from our diesel cars, even though it's now cleaner and more affordable. Still, this model is well equipped and decently finished even if space inside is a little disappointing. 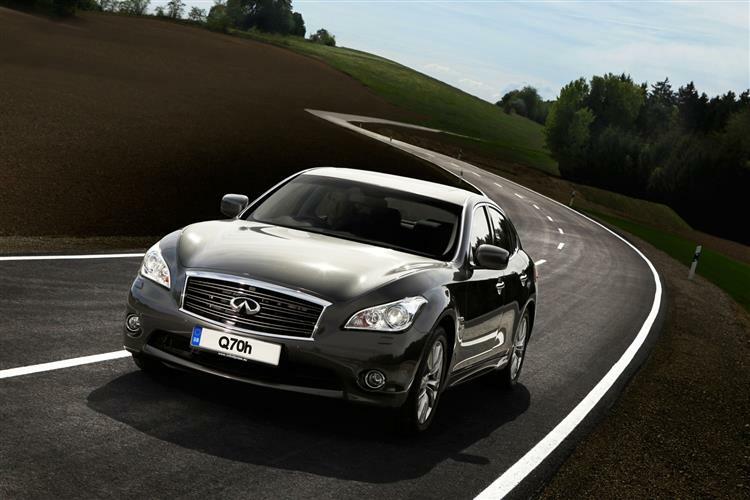 Interesting, different and worthy enough, the Q70 hybrid is clearly targeted across the pond. Despite its name, the Infiniti marque hasn't been around for too long in the UK and it has yet to significantly dent the consciousness of executive class buyers. Happy with their BMW 5 Series, Audi A6, Jaguar XF or Mercedes E Class models, this group of customers has, to date, been targeted by relatively few hybrid models. The modest take up in this area has, to a large extent, been attributed to the sheer excellence of the conventional diesel cars in this class and if the Infiniti Q70 hybrid (previously known as the M35h) is to elbow some of these vehicles aside, it needs to be very special indeed. Unlike Lexus, which seems either unable or unwilling to develop a good executive class diesel engine, Infiniti has one on its books already in the shape of the 238PS 3.0-litre diesel in the Q70 3.0d variant, so the hybrid model feels as if it has been developed from choice rather than necessity. In order to make any headway, it first needs to establish a case for itself over its oil-burning sibling. We've come to expect some sort of technological headliner from most Japanese hybrid cars and the Infiniti Q70 Hybrid is no different. Its most fascinating feature is the Approaching Vehicle Sound for Pedestrians (VSP) which utilises a range of distinctive sounds to help ensure the safety of other road users. VSP is computer controlled and links an in-car sound synthesiser with a speaker built in to the front bumper. It automatically works from start-up to 20mph, cutting back in at 17mph as the vehicle slows. It sounds somewhat like a quieter version of a jet taxiing and gets your attention without sounding harsh or intrusive. Aside from that, the Q70 Hybrid gets a very punchy 306PS 3.5-litre petrol V6 augmented by a 70PS electric motor, which means a very punchy 5.5 second sprint to 62mph. The transmission is an automatic with internal clutch pack and means that there's not the CVT gearbox whine that often accompanies hybrid cars. The extra 120kg of weight added by the hybrid system means that you shouldn't expect this Q70 to feel as wieldy through corners as a conventional petrol-powered 3.7-litre version of this car. It's possible to drive at up to 60mph on electric power alone, but you'll need to have the tactile finesse of a bomb disposal expert with the throttle. Give it any more than about a quarter of the pedal's travel and the petrol engine thrums smoothly into life. The design of the Infiniti Q70 Hybrid appears to draw upon a number of influences. There's something rather Maserati GranTurismo about the front wheel arches and undeniably overtones of Jaguar XF around the front grille and headlamps. The rear end is less distinguished, tapering to a rather generic blend of Japanese and American design cues. The net result is a car that doesn't quite hang together a cohesive package, lacking the dynamic tension of a modern European design. That said, it is quite distinctive. Things get better when you drop inside the cabin. Materials quality is extremely good and the fascia design mirrors the organic sweep of the exterior lines but to better effect. There's standard leather trim with a mix of aluminium and piano black detailing. 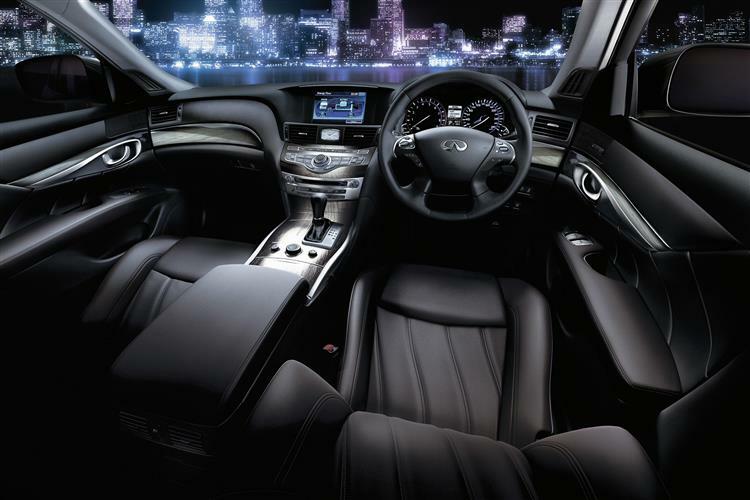 The Infiniti trademark analogue clock sits in the centre of the dash while a large display screen marshals the various ancillary functions. 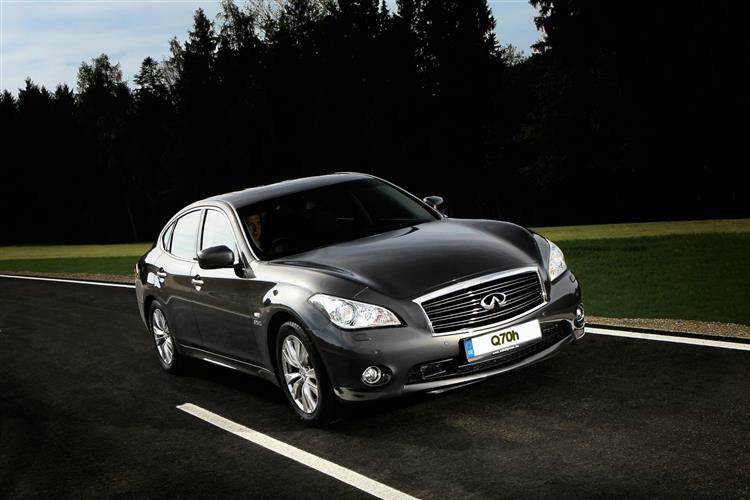 In terms of fit and finish, the Q70 isn't quite on a par with Audi but easily stands comparison with BMW and Mercedes. Space in the front is good, despite the broad centre console, but headroom is a little pinched in the rear. The 450-litre boot is also a fair bit smaller than the 520 and 540-litres of space that you get in the BMW 5-series and Mercedes E-class respectively. Moreover, the rear seat doesn't split or fold which also limits versatility. Prices start at just over £43,000 for the GT version most will want but for £4,000 more, there's a plush 'Premium' model option. Whichever variant you choose, there'll be an abundance of toys to play with. The top Premium model we tried had climate controlled seats, bi-Xenon adaptive headlights and a range of Bose stereo options. The upmarket sound system has Active Noise Control which detects unwanted low frequency noise in the cabin and plays sound waves of the opposite phase to cancel them out. There's also a Forest Air climate control system which gives an extremely high level of control over temperature, humidity and pollution levels. Safety equipment provision is equally comprehensive. As well as the full complement of crumple zones and airbags, there's a raft of electronic aids including Intelligent Cruise Control and a Forward Collision Warning system. As with many hybrid models, the Infiniti Q70 Hybrid can be tough to justify against the price of a solid diesel-engined competitor, but then it's fair to say that this country, with its strong diesel take up and infrastructure, probably isn't one of the key markets. In the US, where diesel engines are still largely reserved for trucks and electricity generators, the hybrid market is booming and that's where this car looks a good fit. Over here, it will suffer from hefty depreciation brought about by Infiniti's lack of badge equity and even though the combined economy figure of 40.9mpg is very good for a petrol-powered executive car, it only just pips the Q70 3.0d diesel model's 37.7mpg showing. The recently improved emissions figure though, does just dip below the important 160g/km threshold. Ultimately however, given that the Q70 diesel variant is considerably cheaper, the hybrid car looks a good buy only for those who vehemently dislike diesel engines or who need to project an environmental message for public relations purposes. 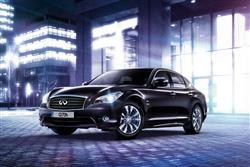 The Infiniti Q70 Hybrid is an impressive foray into a market that has yet to bloom in this country. Executive class buyers remain firmly wedded to their diesel cars and although the Japanese company has clearly thrown a lot of resources at this model and pioneered some intriguing technical innovations, it's not a car that makes an overwhelmingly convincing case on the balance sheet, despite the recent tweaks to pricing and emissions. What you do get is a very well finished car that makes light work of city driving and offers an alternative to the 'too cool for school' understatement of the German marques. Ultimately this car feels exactly what it is - a car targeted at the American market that will garner only very minority interest in the UK. Still, as an example of what Infiniti is capable of, it bodes extremely well for when they design some more Eurocentric products.